While temperatures are starting to mellow out a bit, which is a big relief considering just how hot it has been for the past few months, you are still going to be firing up that AC a couple of more times, most likely. Even if you don’t however, you should still have your system repaired now, if there are problems, rather than waiting for the start of the next cooling season to arrive. Why? Because there is no situation in which it benefits you to put any necessary air conditioning service in Chesapeake off until a later date. 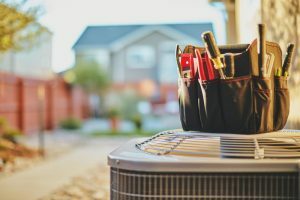 Your air conditioner has taken a beating over the course of the summer months, and any number of problems may have developed. There are a lot of components working away within the system that are going to feel the effects of a season’s worth of wear and tear. One issue that you may run into is faulty capacitors. Wait—What the Heck Is a Capacitor? A capacitor is an electrical component that can serve a few functions. It can store power, for instance, and it can regulate the flow of electricity within a system. While there are different types of capacitors, including some that serve multiple functions, we are going to be focusing on basic start and run capacitors today. As you’ll see, any problems with these components are going to cause some serious headaches for homeowners when temperatures start to soar. Start capacitors are used when the air conditioning system is first starting up. It takes more energy to get an air conditioner going than it does to keep it running (which is why short cycling can drive up energy costs so much). In order to ensure everything gets running smoothly, the start capacitor provides the extra torque necessary to set the system off and running. Once it is running, of course, there is the matter of keeping it running. Run capacitors are used to do just that. Voltage can vary quite a bit as the air conditioner operates, and that is not conducive to a consistent cooling performance. The run capacitor is there to ensure that there is a constant and appropriate voltage running through the system, so that your air conditioner is able to cool the air in your home reliably. The last thing that you want to do is to make a problem worse or damage your air conditioner by attempting to repair it on your own. When you’re talking about electrical components, you are also talking about a potentially dangerous situation. If your air conditioner won’t start up, or if it starts but runs only very briefly before cycling back down, then it is likely that you have a capacitor issue. Contact us right away if you suspect that this is the case. Forcing an AC to continue operating under such conditions will do nothing except make the problem worse. Contact House Call Company and see how we can make you smile.